NICK’S Window Cleaning is the most trusted cleaning company in Mississauga and it also specializes in eavestrough restoration services. We make sure that your eavestrough are working properly. We offer a wide range of services ranging from smaller cleaning problems to larger reparation problems. We have been serving Mississauga for more than ten years and have managed to earn the status of the most reputed gutter repair company throughout the city. Our team consists of highly trained and experienced technicians who deliver best services at your doorstep. Our employees have WSIB coverage and we also have full liability insurance. Rain gutters meets different kinds of failures in their lifespan. These failures may originate from improper installation or any other problem creating clogging issues. These problems ultimately lead to leakage of water from various parts of gutters especially seams or joints, commonly known as seam failure. Seam fails due to deterioration of sealing compound in seams or joints. Seam restoration is the only way to stop leakage problems. It is, in fact, the most efficient and quickest way to solve many gutter problems. It includes the mending of joints at the affected sections of gutter. Our technicians are well versed in tackling leakage issues especially seam restoration. If you want your gutter system to last for a long time then you should get it inspected at least twice a year by experienced industry professionals. Many people avoid small issues in their gutter systems but remember that these issues, if ignored, can change into larger and costlier problems. Sagging of gutters is the most suitable example in this regard. Many people do not get their sagged gutters treated unless they start leaking or a complete failure occurs. Sagging occurs when water gets accumulated in clogged gutters. Our technicians are experienced in cleaning debris and trash that results in clogging of gutters, thus avoiding sagging and the problems caused by it. Gutters of large facilities have larger areas and carry a large volume of water in them. They are more susceptible to all sorts of failures dur to their heavy usage. Debris accumulation, spikes failures, clogging, sagging and leakages are more common, especially in extreme weather conditions. Fallen leaves in autumn also put a lot of weight on such gutters. That is why they require more rigorous and frequent maintenance. But, the best thing about us is the behaviour of our employees towards customers. We strive to earn the trust of our customers and build a long-lasting relationship with them. We respect the valuable properties of our customers. Rain gutter system or eavestrough is an important part of drainage system. It must be maintained regularly but unfortunately many of us do not pay heed towards its proper maintenance. Negligence in this regard can create severe costlier problems like moisture accumulation in walls and foundations. Many people try to do repair work in their houses by themselves. They do not want to spend any more money since they already have spent a lot on their houses. But that does not work in case of gutter system. Without proper knowledge and tools, you will probably end up creating more problems in the system. 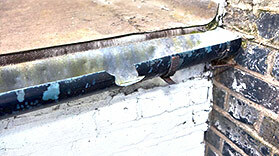 You should also avoid doing gutter repairing work by yourself because it is a very dirty and risky work. Without proper equipment, you and your property are equally at risk. 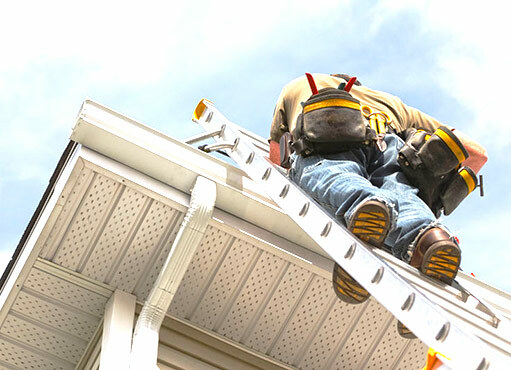 Many people have been seriously injured while trying to repair their gutters by themselves. NICK’S Window Cleaning offers all sorts of eavestrough restoration services. We make sure that your gutters are working properly. We do all kinds of gutter work, whether it is mere cleaning of eavestrough or mending of seams, repair of broken ferrules or failed spikes, clogged outlet or sagged gutters, we restore everything to its original condition. We are an established company in Mississauga with more than ten years of experience in all kings of gutter repair work. We have the best team of friendly and skilled technicians. Our rates are affordable. Our service is the best!